Rather appropriately, I discovered the art world’s big news in the pages of the Financial Times. Pablo Picasso’s Women of Algiers (Version O) sold for US$179.4 million at auction – the highest price ever paid for a single work. 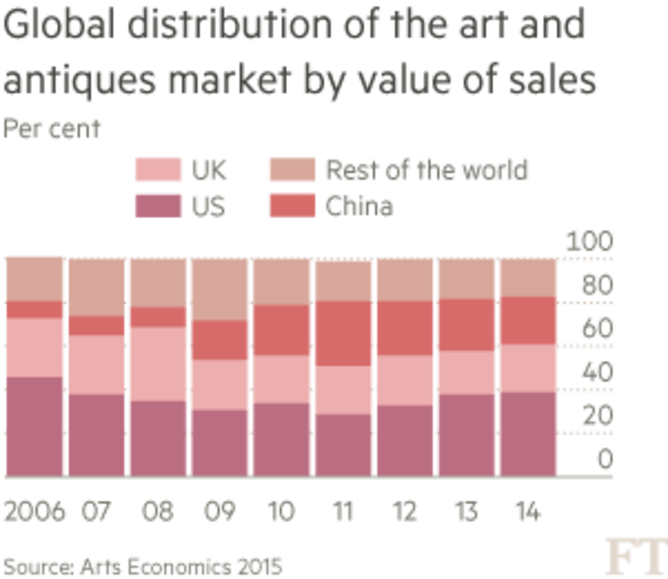 The overall market for art, the FT breathlessly reported, was worth €51 billion in 2014. Even allowing for the euro’s diminished status, that’s still big bucks. To put this in some sort of perspective, the United Nations is trying to raise about US$400 million to provide assistance to the victims of the earthquake in Nepal. In other words, with a couple of minor Picassos and maybe a Matisse, it’s job done: hundreds of thousands of lives are transformed and all that money is put to good use. Of course it won’t happen. Not only are pieces of painted canvas worth immensely more than the lives of individual human beings – especially those of little economic significance in the “developing world” – but to expect anything different is also to fundamentally misunderstand the significance of art in the contemporary era. Art ceased to be avant-garde and intellectually revolutionary a long time ago – when Picasso was in his prime, in fact. What Robert Hughes famously called the “shock of the new” has long since faded and art has resumed its former role as a type of decoration, albeit a sometimes imaginative, even moving one. But the most important function of art these days is as a way of protecting wealth at a time of global financial uncertainty and declining yields. Which is why the world’s wealthy are so keen to secure their personal masterpiece. In this regard art is doubly attractive. Not only does some of it – especially the older stuff – look quite attractive, but it is the quintessential “positional good” – something so exclusive only a few can own it. In the case of trophy paintings like Women of Algiers, only one person can own it. Consumption doesn’t get more conspicuous or gratifying to the ego than this. The commodification of art and the astronomical sums it can command was bound to attract those motivated more by the pursuit of lucre than the quest for beauty. And so it has proved. 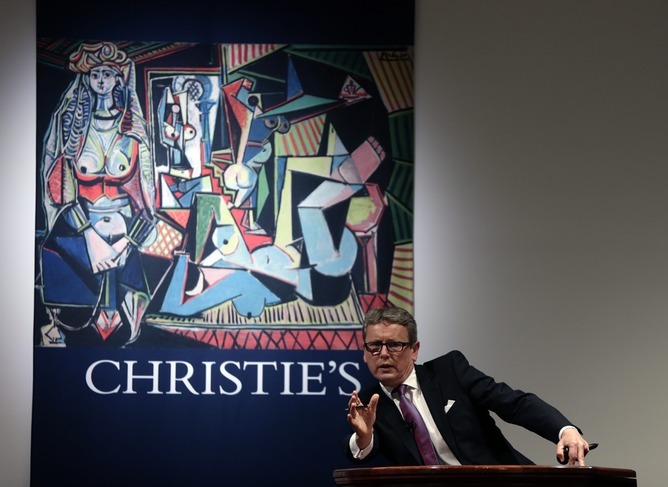 It is not just the galleries and the auction houses that have benefited from their dazzling ability to hang pictures on walls or organise international telephone hook-ups. Some of the “artists” themselves have joined the feeding frenzy. No one better exemplifies this possibility than Damien Hirst, one of the leading figures in the Britart movement. Hirst’s real genius – the word may indeed be merited – has been in “leveraging the brand”. Having made himself a household name with a series of mildly amusing visual gags – the sharks in formaldehyde etc – he went into mass production, uncannily mirroring the trajectory of industrial capitalism in the process. Hirst’s capacity for exploiting his workforce would do any Victorian mill owner proud, too. In 2007, Lullaby Spring, a cabinet filled with hand-painted pills, sold for £9.65 million. The workers who actually painstakingly assembled it were rather less lavishly renumerated: less that £20,000 per year, in fact. When it was suggested to Hirst that another of his productions – The Complete Spot Paintings, of which there are well over 1,000 – were actually not painted by him but his minions, he retorted that “every single spot painting contains my eye, my hand and my heart”. Not to mention his genius, of course. That the spivs, the self-promoters and the self-obsessed should be attracted to a world where egoists and narcissists are encouraged to take themselves even more seriously than usual should not surprise us, perhaps. What is surprising is that some people are willing to pay them so much money to produce such appalling tat – Tracey Emin being one of the principal exhibits in this regard, despite some stiff competition. Perhaps I’m simply old-fashioned and a bit of a Philistine. Yet I’ve nothing against things that are nice to look at – even beautiful. I have a framed print by Fred Williams which has given me pleasure for years. I could never afford to buy the original and I’m not sure I would if I could. We don’t actually need to own things to enjoy them, after all. On the other hand, if we want redistribute wealth and encourage artistic endeavour, there are lots of “undiscovered”, impecunious locals we could support. Flaunting one’s ability to enjoy exclusive possession of rare and ultimately unnecessary things is actually a bit unpleasant and possibly not the sort of thing you’d want to encourage in your children. Why do we apparently admire it when practised by the handful of plutocrats who possess as much wealth as half the world’s population combined? Perhaps it was ever thus, but such behaviour seems especially jarring at a time when the unbeautiful juxtaposition of the fortunate and the forgotten ought to be evident to anyone with eyes to see.